Property 4: ☀️ LUXURY ⛱ | AC | Upgraded Family Beach Home, Private Ground Floor Patio, BBQ, Garage! 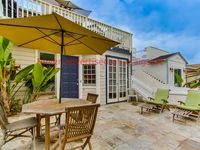 Del Mar Beaches ~ Luxury Ocean View Townhome! Property 6: Del Mar Beaches ~ Luxury Ocean View Townhome! Property 10: Beach, fun, sun and a modern condo too! Property 19: Updated Clean Townhome, 30 days rental welcome! 3 bedroom, 4 bath, near beach/bay, Family/Pet Friendly, hot tub. Property 20: 3 bedroom, 4 bath, near beach/bay, Family/Pet Friendly, hot tub. San Diego Townhome w/ Ocean Views from Balcony! Property 21: San Diego Townhome w/ Ocean Views from Balcony! *UPGRADED* Beach House- Ground Floor Patio, Garage Parking, BBQ, Large MASTER BR!! Property 24: *UPGRADED* Beach House- Ground Floor Patio, Garage Parking, BBQ, Large MASTER BR!! Property 26: Spacious Ground Floor 2 bed 1 bath short walk to bay! Fun & Relaxing Townhouse just steps from the beach! Property 28: Fun & Relaxing Townhouse just steps from the beach! Nantucket Style Beach Home w/ Private Ground Floor Deck, BBQ, Fireplace! Property 29: Nantucket Style Beach Home w/ Private Ground Floor Deck, BBQ, Fireplace! 🏖 Spacious Family Beach Home w/ Central AC ❄️ + Garage + Beach Toys + Bikes! Property 33: 🏖 Spacious Family Beach Home w/ Central AC ❄️ + Garage + Beach Toys + Bikes! Single Family La Jolla Home! **Rates as low as $275/night! Property 37: Single Family La Jolla Home! **Rates as low as $275/night! NEWLY RENOVATED OCEAN FRONT 3BD! LARGE BOARDWALK PATIO! AVAILABLE LABOR DAY! Property 41: NEWLY RENOVATED OCEAN FRONT 3BD! LARGE BOARDWALK PATIO! AVAILABLE LABOR DAY! 718 Balboa Ct. 2BR/2BA-1st fl.100ft. to Ocean Sand - April availabilities. Property 43: 718 Balboa Ct. 2BR/2BA-1st fl.100ft. to Ocean Sand - April availabilities. Top floor 3 bedroom open and airy condo! Property 46: Top floor 3 bedroom open and airy condo! *Ground Floor* Family Beach House, Private Front Patio & BBQ! Property 49: *Ground Floor* Family Beach House, Private Front Patio & BBQ! Steps from the beach and down the street from Belmont Park. The house has everything you need. The pillows should be replaced and the garage is tight but we were able to back our mini van in the space. If you enjoy the beach you can't go wrong with this beach cottage. I had a question and David answered immediately. There were five of us and it was comfortable. The unit was clean and tidy .Dora the property manager was welcoming and provided all what we needed in the unit during our stay. The unit had 15 steps to enter the unit. The heating unit did not work from the first day and the bathroom did not work properly. The manager provided us with a portable electric heater then fixed the unit after one week. The toilet also get flooded and the manager fixed it immediately. So far we have not received our $500 deposit from the owner. My overall impression that the unit it now is in excellent condition after the needed repairs.